West Vancouver 3 Bed 3 Bath Furnished House w/ Huge Deck - 7500 — Lynn Swanson At a glance guide to all currently available fully furnished properties managed or represented by Sunstar Realty Ltd. Most properties include: fully furnished from cutlery to linens, fridge, stove, dishwasher, microwave and washer/dryer; and also includes maid service twice a month, local telephone, cable, and high speed wireless internet. Not included: long distance telephone, gas and electric, additional cleaning & move-out clean. LOCATION: This Park Royal location is quick and easy to all kinds of amenities at the mall (WholeFoods, SportCheck, Shoppers Drug Mart, Saks 5th Ave, Aritzia, Simon's, Cactus Club, Tap House and Tratortia to name a few), Lions Gate Bridge and Downtown, but what you may not know is you can easily connect to walking/biking trails in Capilano Canyon, the North Shore Mountains West Van seawall and Spirit Trails for exercise, peacefulness and the true West Coast experience. Transit 1 block walk to Marine Drive. In the catchment for West Van High. 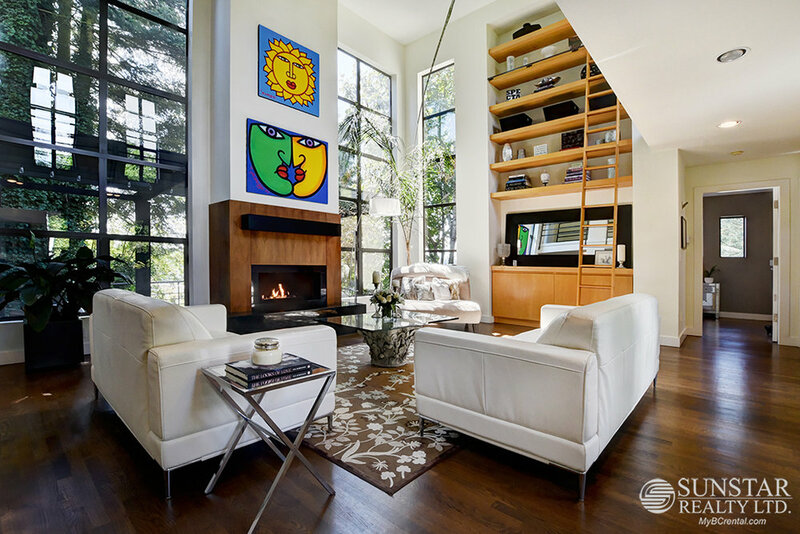 FEATURES: Exceptional 3 bedroom, 3 bathroom architectural home has the feel of a gallery, offering 20' ceiling of living, library with 16' ladder and catwalk,is situated on a large, private, treed 10,000+ property. Main floor includes, entryway, living room, kitchen, laundry room, (and entrance from garage), 3rd bedroom with ensuite bath (beautiful walk in shower, vessel sink). Gourmet kitchen (with SS gas range, side by side SS fridge and Bosche SS dishwasher and large dining tabel) leads to a 23' by 20' deck with surrounding trees for privacy. Solid oak floors run throughout the entire main level. Experience the natural outside beauty from large windows in every room, including the livingroom's double height floor to ceiling windows. 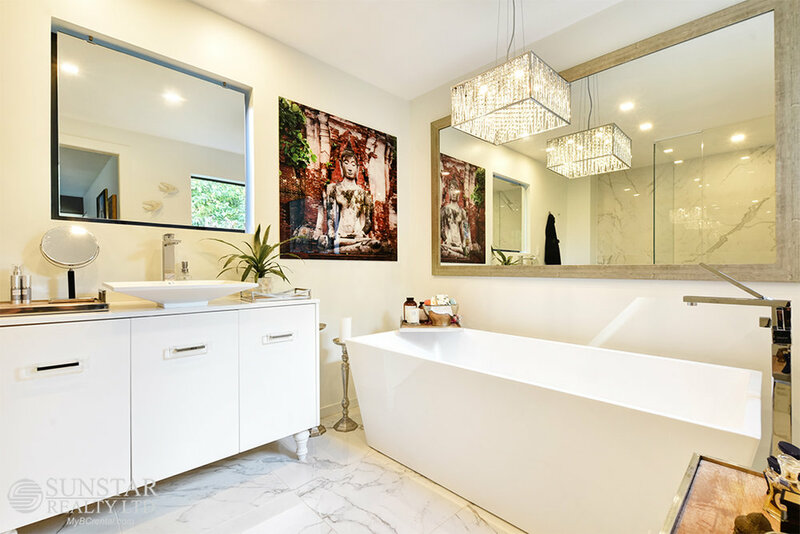 Upstairs, master bedroom with King bed is ensuite to a gorgeous 4 piece bathroom with walk in shower and sleek free standing soaker tub. 2nd upstairs bedroom with Queen bed, is ensuite to a 3 piece bathroom. Bedrooms are located at the opposite ends of the home for added privacy. Walking distance to Park Royal and quick access to Downtown; still, surrounded with lots of trees for a park like setting. Other features include professionally landscaped front yard with patios and private entrance and one car garage. -	We do not charge prospective tenants any handling fees, application fees or processing fees. -	This property is not offered on a first come first serve basis; all applications will be carefully screened before presentation to owners for selection. -	It takes 2 to 3 business days to process each completed application. -	Payments from all major credit cards and direct debit accepted (subject to transaction fees charged by Rentmoola, and only applicable to fully managed properties). -	All measurements are approximate and all information presented herein obtained from sources believed to be reliable; user to verify and be aware that Sunstar does not assume any responsibility and/or liability for the accuracy of such. West Vancouver Furnished Condo - Sunstar Realty Ltd.